It has been a rainy weekend on the Amalfi Coast, and we’re all wondering just what happened to spring. It seemed like it had arrived early when the mimosa bloomed at the beginning of February. March and the first half of April were picture perfect nearly every day. Then at the end of April it seems nature got a memo that we all missed and it has been cooler than usual and rainier than usual. I know I know it’s spring. But I’d just like a little more spring before summer arrives! So until the weather straightens out a bit, here’s a straight shot of spring that I photographed back when the mimosa was blooming in Scala. 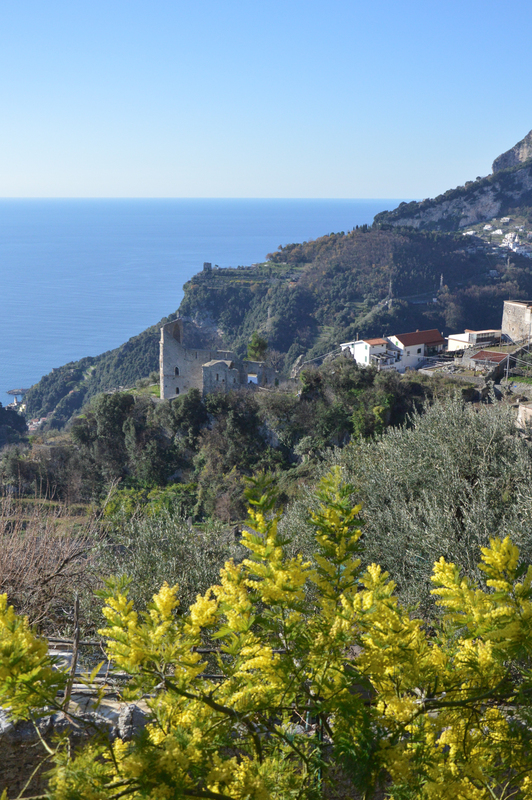 The frazione, or neighborhood, of Minuta in Scala has incredible views overlooking the valleys down to Atrani and Amalfi. In the photo above you can see the ruins of the church of Sant’Eustachio in Pontone, which is another frazione of Scala. After a dreary and wet winter, there’s nothing that says spring more than the brilliant mimosa blossoms on a clear blue day. I didn’t edit these photos – that’s really how intense the colors are. I could just eat up those blossoms! 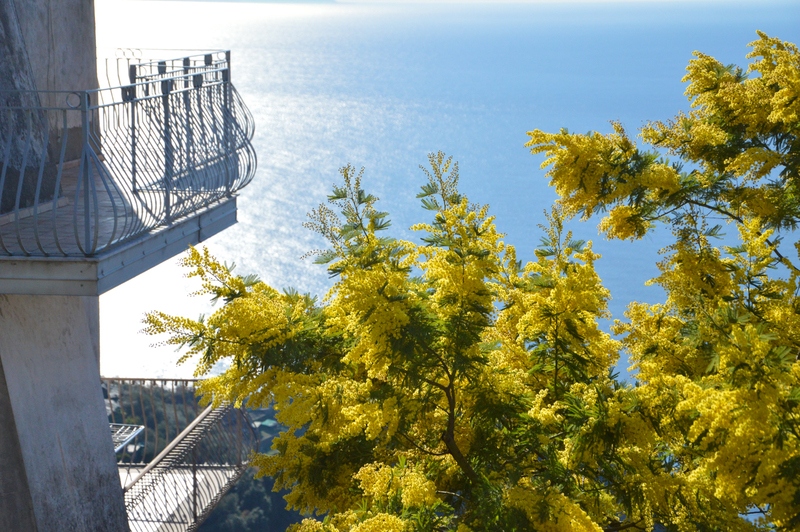 Blue and yellow together is one of my favorite color combos, so I really just can’t get enough of the mimosa when it blooms on the Amalfi Coast. But you have to arrive early. 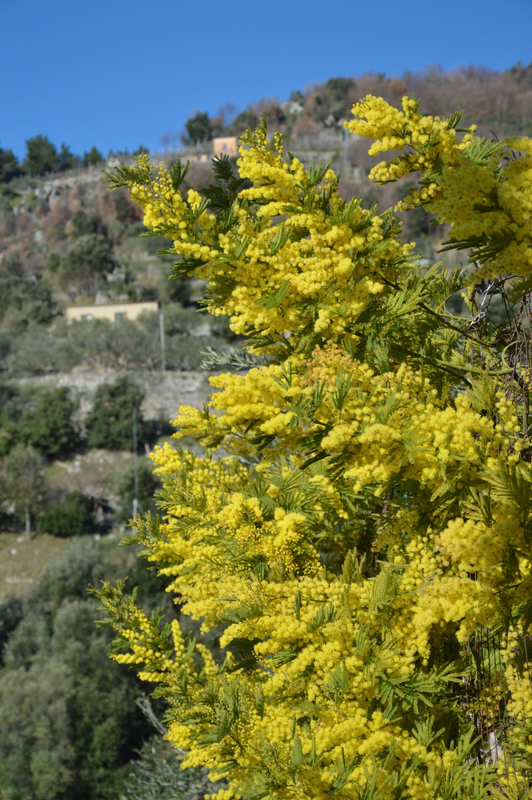 While mimosa is the traditional Italian symbol of the Festa della donna, which is on March 8th, it is usually finished blooming by then in this area. These photos were taking during the first week of February. But the photos, well, those we can enjoy year round! Beautiful reminders of Italian spring. Here in Nebraska we’ve had some warm days but now it’s much cooler. Almost feels like fall. Back to spring please! 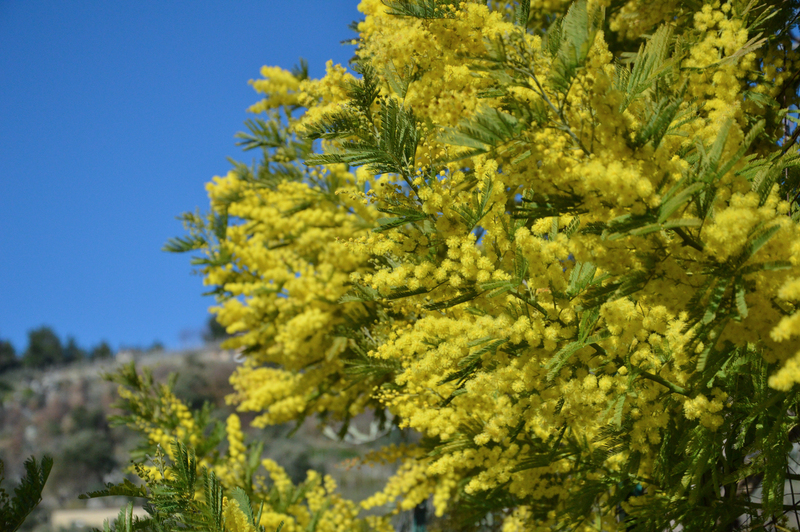 Mimosa are so beautiful against the blue sky of Amalfi! Wonderful photos! So glad I’ve found this blog! Thanks so much for your sweet comment, Kathryn! I’m so pleased you found Ciao Amalfi, too. Look forward to keeping in touch!